My son recently asked me whether he had saved much CO2 from being emitted into the air by using the Little Sun solar lamp I designed. He also wanted to know why, if a tonne of CO2 weighs so much, it does not drop to the ground. And where is it? To him, a tonne is heavy and physical and not an intangible mass distributed in the atmosphere. His questions made me realize how little I myself know about CO2. When I was my son’s age, back in the late seventies, there was no discussion of climate change. Nature was where I spent my summers, in a tent in the Icelandic highlands, a stark contrast to the Copenhagen I lived in. These natural and manmade realms could not be more separate. But today, there is no nature outside of human activity. Our survival and future depend on understanding the effects of CO2 consumption and acting on that understanding. But what do we understand? What, for instance, is a tonne of CO2? Is it hot or cold, wet or dry? Perhaps it would help to know that one tonne of CO2 could be imagined as a cube the size of a three-storey house or that, when frozen, it would form a block of dry ice about 0.67 cubic meters in size. But what does that actually tell me if I do not know how much CO2 I produce in a year or on an average day? What does it tell me if I do not sense my interrelationship with planet Earth? We need science to tell us that the weight of CO2 is based on the atomic mass of the molecules. A scientist can tell me that a tonne of CO2 is equal to the energy expenditure of a house for about a month, a small car driven for two days nonstop or a 747 flying for less than two minutes and that because of the greenhouse effect, excessive amounts of CO2 in the atmosphere lead to global warming. But for many people, science alone is not enough to compel action. It struck me, when I was looking up this data, that it was familiar, that I had seen it more than once in the media and that I somehow knew most of it. So I asked myself why does knowing not translate into doing when so much is at stake? This is where culture has something to offer. Culture can help us make sense of abstract concepts and information in ways which resonate. The visual arts, theatre, poetry, literature, dance, architecture and creativity in a broad sense help us build a relationship with abstract ideas, making them concrete, felt. Culture can add motivational impetus to the knowledge we gain from science. Importantly, however, culture can bring people to the point of action without prescribing the actual action. It does not tell us what to do or how to feel, but rather empowers us to find out for ourselves. Today, in politics, we are bombarded with emotional appeals, often linked to polarizing, populist ideas. The great thing about the arts and culture, on the other hand, is that they allow spaces to emerge in which people can disagree and still be together, where they can share individual and collective experiences, and, in the process, form diverse communities based on inclusion rather than exclusion. Experiences like these can become exercises in democracy, inspiring trust, in ourselves and in society. When I work in my studio, I draw inspiration from the fact that neuroscientists and psychologists recognize that the brain has two different systems for processing perceptions: one is analytical and deals with facts and data, and the other is experiential and deals with emotions and instincts. The experiential system— activated when you encounter art, for instance— tends to be the stronger motivator. Much of the communication on climate change, however, is focused on the analytical, attempting to reason with people to change their behaviour. Although it is clearly important to ground action in knowledge and rational thought, we also need to understand the central role of our experiential system in motivating action. Ice Watch, an artistic intervention that I created with Minik Rosing, a geologist and expert on Greenland, takes an experiential approach by bringing people into direct contact with the physical reality of climate change. 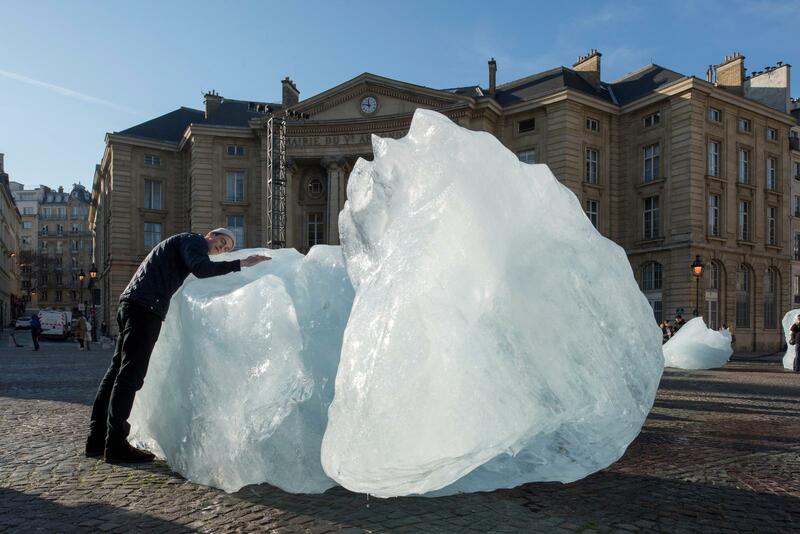 In 2015, during COP21 in Paris, we brought almost 100 tonnes of glacial ice from Greenland to the Place du Panthéon. Visitors touched the blocks of ice as they melted, put their ear to them and even tasted the ice. When we asked people about their responses, most described feelings; they felt touched. Some spoke about the sounds of the melting ice, like miniature explosions— as if the small pockets of compressed air, frozen inside the turquoise ice for millennia, were speaking to us from the past. Contact with the ice afforded an experience of its fragility, of time and of the distant Arctic. It was both concrete physical and spatial as well as abstract and contemplative. Together, the emotional and intellectual experience allowed each of us to host the climate debate in our bodies, paving the way for an embodied understanding of our changing environment and planet. Culture can inspire people to move from thinking to doing, and it holds the potential to inspire great social change. It is only by connecting the head and the heart that we will succeed in building a future for the planet shaped by positive, powerful climate action.